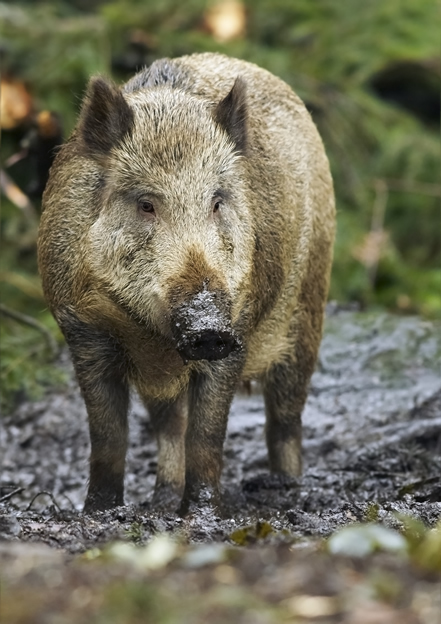 Feral hogs are among the most destructive species of non-native mammal plaguing the Southern United States today. These hogs are omnivores, indiscriminate eaters and opportunistic predators that devour everything in their path, nonstop. They have been known to prey upon reptiles, amphibians, birds and small mammals, but larger fowl such as turkey are not immune from the hog’s appetite. Feral hogs are mostly social animals traveling in groups, known as sounders, of 10-40 adults. Sows begin to reproduce at the age of 8 months and can have up to 3 litters, averaging 6 piglets, every 24 months. They were brought to the Americas by early Spanish explorers and have since spread across the United States and Canada leaving approximately $400 million worth of damage annually in their wake. They erode soil, destroy crops, going through an entire field in one night, tear up recreational areas, terrorize tourists in state parks, and worst of all squeeze out the native wildlife. Feral hogs are dangerous and destructive animals that should be left to professionals to remove and control. We can assess your threat and provide you with a plan for removal and continued control and prevention of these animals.